Works by Pawel Althamer/Nowolipie Group, Phil Collins, Dora Garcia, Christoph Schlingensief, Barbara Visser, Donelle Woolford, Artur Zmijewski. Double Agent is an exhibition of contemporary visual art performance, featuring works in which in which the artist uses other people as a medium. The last decade has witnessed a resurgence of interest in performance among contemporary artists, but today’s artists, unlike their precursors in the 1960s and 70s, do not necessarily privilege the live moment or their own body. Instead, they work with a range of media that includes video and photography, and are notable for their interest in strategies of mediation that include delegation, re-enactment and collaboration. The works in Double Agent raise complex questions of authorship, and in particular the ethical implications that ensue when the artist is no longer the central performer in their own work, but operates through a range of individuals, communities, surrogates and agents. By its very nature performance embodies unpredictability and risk, and the works in this exhibition demonstrate new approaches to risk, especially in the way they undermine the idea of the authentic or authoritative performer, substituting it with a variety of displaced, partial and unreliable figures. Double Agent features seven international contemporary artists, represented by film, video and sculpture, as well as by live projects staged in the galleries. The exhibition includes both relatively established figures and a number of younger or more emerging artists, and features several new commissions as well as the UK premieres of a number of significant works. A number of the artists habitually surrender some of their agency in order to make works with multiple collaborators. Phil Collins (English, born in 1970 Runcorn, lives in Glasgow) is the author of The World Won’t Listen, a series of karaoke films created around the world with fans of The Smiths. Collins will be represented in Double Agent by a new commission for the Mead Gallery, which explores the practice of ghost writing. Other artists are notable for their exploration of the ethics of performance and representation, including the power relations involved in the use of collaborators. The theatre director Christoph Schlingensief (German, born 1960 in Oberhausen, lives in Berlin) is represented by Freakstars 3000, 2003 which uncomfortably parodies the talent show Popstars since, unlike the real show, here all the contestants have a disability. 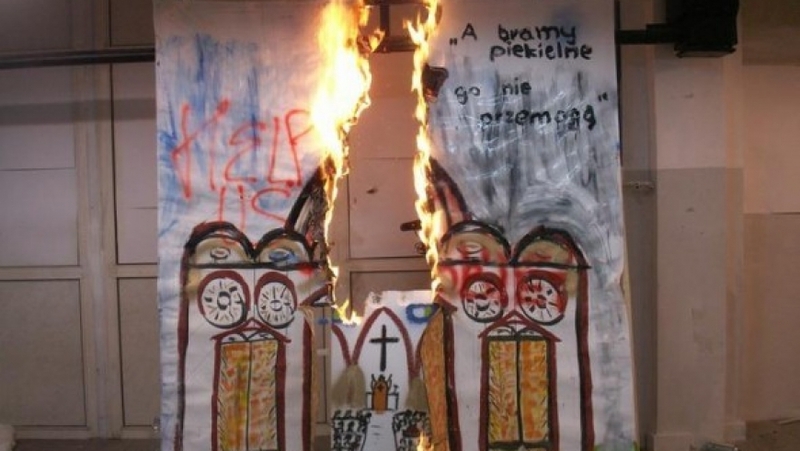 In the video Them (2007) by Artur Zmijewski (Polish, born 1966 in Warsaw, lives in Warsaw) the artist contrives a series of confrontations between Christians, Jews, Young Socialists, and Polish nationalists: the tensions build between the groups and culminate in an explosive impasse. Zmijewski’s role is characteristically manipulative, constructing a situation in which it is unclear when the participants are playing a game or acting in reality. A number of the artists explore authorship and responsibility through the use of stand-ins for themselves. Barbara Visser (Dutch, born 1966 in Haarlem, lives in Brussels and Amsterdam) will show the video Lecture on Lecture with Actress (2004), in which an actress gives an artist’s talk as Visser, while the latter instructs the former what to say through an earpiece. The collaborative work of Pawel Althamer (Polish, born 1967 in Warsaw, lives in Warsaw) is frequently based on his identification with marginal subjects, including the homeless, people with learning difficulties, and children. Several artists will provide a live component to the exhibition. Dora Garcia (Spanish, born 1965 in Valladolid, lives and works in Brussels) is known for works such as The Sphinx (2005), in which visitors are invited by an invigilator to answer a series of questions. The piece ends when a visitor manages to give exactly the same answers as those supplied by Dora Garcia, whereupon they are photographed and exhibited in the space, the exhibited object becoming the person who best forms a proxy. Garcia will be represented by a new commission. A recent project by American artist Joe Scanlan (American, born 1961 in Stoutsville, OH, lives in New Haven, CT) will form the conceptual core of the exhibition: the artist Donnelle Woolford, a young black woman who functions as a stand in for Scanlan, will be present in the gallery for specific periods, working on cubist-inspired assemblages. It is unclear to what extent Woolford is real and to what extent she is a fiction designed by the artist. The exhibition has been designed to operate within the context of an arts centre, making connections between artists working across film, video, theatre and performance. The exhibition is a collaboration between the ICA and Mead Gallery, Warwick Arts Centre and will build on the organisations’ long-standing interest in inter-disciplinary practice. The exhibition is being curated by Claire Bishop and Mark Sladen. Claire Bishop teaches in the History of Art department at the University of Warwick. She is a leading expert in new visual art performance, and has written extensively on this subject.